overall shape, bill shape, leg length, or tail length or shape. They do not exhibit any great variety of crests, ruffs, or other feathered ornament, but many are richly colored and beautifully patterned. Indeed, even the most plain have some exquisite subtlety of color visible in a close view. The bill is strong and slightly decurved, sometimes with a very slightly developed hook. The stout tarsi (legs) have fused horny plates, which are often stronger and larger than in related birds, in keeping with the thrushes' mode of life, which is carried out more on the ground than in trees. Typically, thrushes run and hop or combine the two in a kind of hurried shuffle across the ground, but they are also adept at perching in trees, on overhead wires, on rocks, and on all kinds of artificial structures. The wings, which have 10 primaries, the outermost often very short, are somewhat rounded except in species that are true migrants, which tend to have longer, more pointed wingtips as might be expected from the journeys they undertake. Some species even show subspecific differences in this regard, with those that migrate farthest having longer wings than more resident species. The tail has 12 feathers. Usually it is only moderately long, sometimes rather short, and square-tipped, conforming to the thrushes' common conformation. In many species, adults of both sexes are alike, but in others there is a marked difference. Within true thrushes, blackbirds (Turdus merula) include jet-black males and plain brown females, while male and female song thrushes (T. philomelos) are identical, as are both sexes of the related American robin (T. migratorius), although most females tend to be a little plainer than males. There is little seasonal variation, although paler feather fringes giving duller colors in winter may wear off to reveal stronger patterning in spring, and bill colors may intensify. More usual is a marked difference between adults and young, with a much more spotted effect common on juveniles. In some smaller chats such as the redstart (Phoenicu-rusphoenicurus) and northern wheatear, juveniles are very like freshly molted fall adults, if not inseparable. Most wheatears (Oenanthe) have strikingly white rumps and upper tail coverts, usually combined with white beneath the tail and a bold black bar across the tail tip. In some, the center of the tail is black, too, creating a black T shape against an eye-catching blaze of white. This is usually more or less hidden on a perched or standing bird, but revealed in a sudden flash of white as the bird takes flight. Many typical thrushes and smaller North American thrushes are brown above and pale below with dark spots. Separating them may rely on rather subtle differences: the wood thrush (Catharus mustelina) is brightest and reddest around the head, grayer towards the rear, while Swainson's (C. ustulatus) and gray-cheeked (C. minimus) thrushes are duller overall, and the hermit thrush (C. guttatus) is dull on the head but redder on the tail. Rock thrushes (Monticola) are richly colored, with variable blue or blue-gray on the head and back, and deep orange to rusty-red on the underside and tail. The tropical whistling-thrushes (Myophonus) have some spectacular deep blue plumages, highlighted by small spots or crescents of electric blue or white, while the Zoothera thrushes include several glorious black, rufous, and white species, a number that are largely rich orange or orange and gray (often with white, spotted wing bars, and black and white face patterns), and some more typically spotted species. The rich orange combined with striking black, white, and gray is repeated in a number of the African robin chats (Cossypha). Nightingales (Luscinia) are rather dull and plain, but the related bluethroats include males with stunning deep sky-blue gorgets (neck ruffs), some marked with a central spot of red or white. 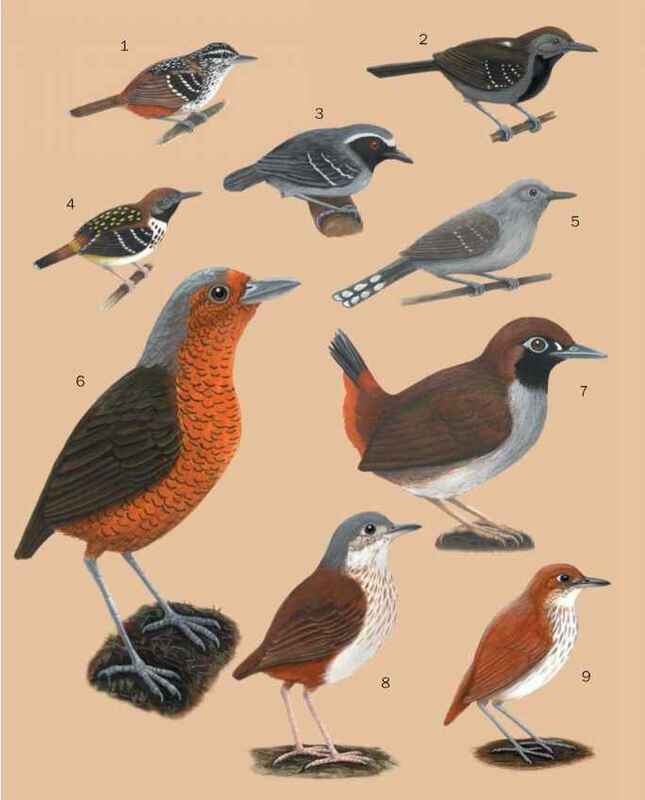 Some larger African chats, the small nightingales and bluethroats, and many true thrushes are especially prized for their vocalizations. In many parts of the world, the dawn chorus of territory-holding birds in woodland or suburban gardens is largely made up of thrushes and chats singing loud and long, each species with its characteristic sound and pattern. In Europe, the blackbird and song thrush are common and expert songsters, while in much of Africa the songs (and in some cases, duets) of such birds as the white-browed robin chat (Cossypha heuglini) and olive thrush (Turdus olivaceus) are essential to the aesthetic enjoyment of each dawn and dusk.